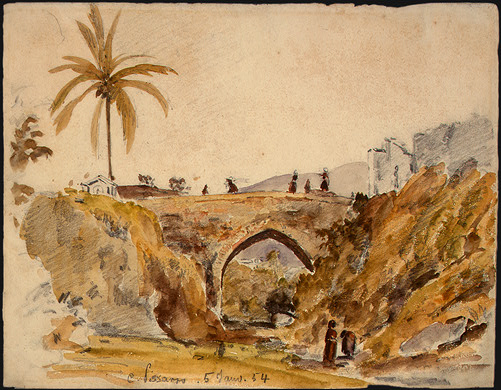 This watercolor of a stone bridge in Caracas focuses on the carefully described archway in the center. Through the arch, we see the foothills of the mountains beyond. As he does in later pictures of bridges in Rouen, Pissarro shows people on the bridge and others in the valley below, which establish the height of the bridge. The density of the graphite strokes underneath the watercolor, faithfully depicts the solidity and magnitude of the rocky hillsides. To portray the different facets of the rock, Pissarro uses parallel strokes, most evident on the left side where the color is lighter. They closely resemble the natural layers found in rock and provide a strong contrast to the blocks of stone used to create the arch of the bridge. The skill he displayed in this simple watercolor demonstrates that Pissarro was a highly competent artist long before the birth of Impressionism. One warm spring day, Pissarro took his easel to the banks of the Oise River and made a painting that is archetypical of the Impressionist movement. 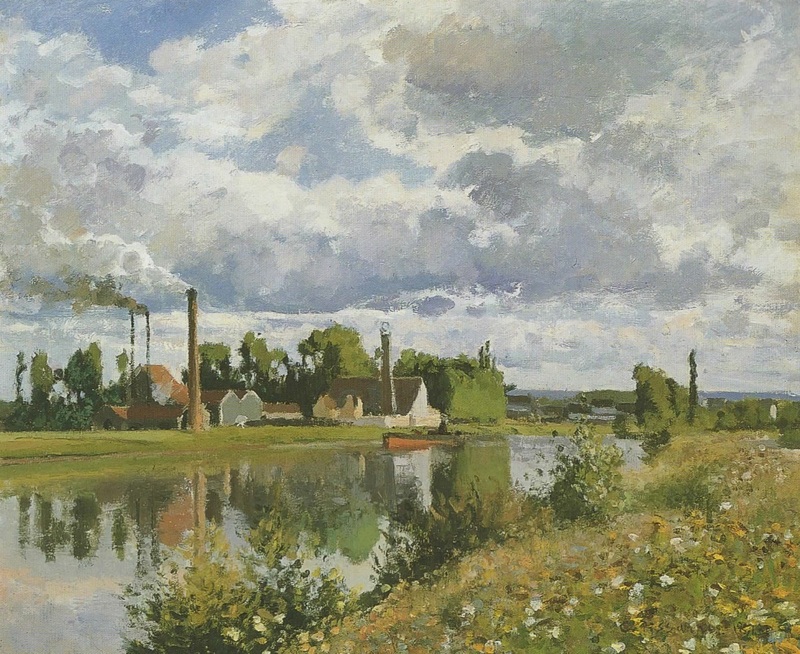 It contains nearly all of the characteristics commonly associated with the Impressionist style: the lavish portrayal of sunlight; the consciousness of the changing weather as grey clouds crowd the intense blue sky; the presence of modernity in the new factories lining the bank of the Oise River; and the immediacy of the scene which bespeaks en plein air painting. The painting itself has a classic composition divided almost equally between the sky and the earth with the river dwindling away on the right side. The water, still as a mirror, reflects the smokestacks and buildings on the other side and connects them with the freshness of the spring flowers in the right foreground. The factory, a distillery, had just been completed in 1872. The white building with the small smokestack is still there along with a few of the small buildings. Pissarro was intrigued by motifs that were typically English. 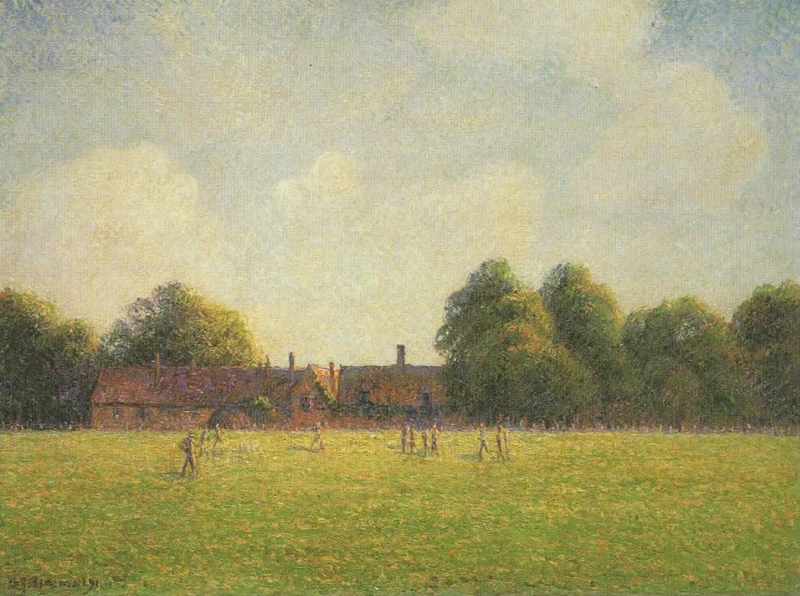 During his second London visit in 1890, he painted his first cricket match. He must have enjoyed the game because he painted two more cricket matches on his fourth London visit. A cricket match is not the easiest thing to depict—the players are spread out over a large playing field. Pissarro capitalizes on the expansiveness of the green lawns edged by magnificent shade trees. He allows them to extend well beyond the edges of the canvas, giving a feeling of endlessness. This and the substantial clubhouse buildings must have been an interesting change for the painter who generally confined his motif to what the eye would see in a glance. Since the painting carries the date of 1891, Pissarro must have finished it in his studio in Éragny after his return from London.